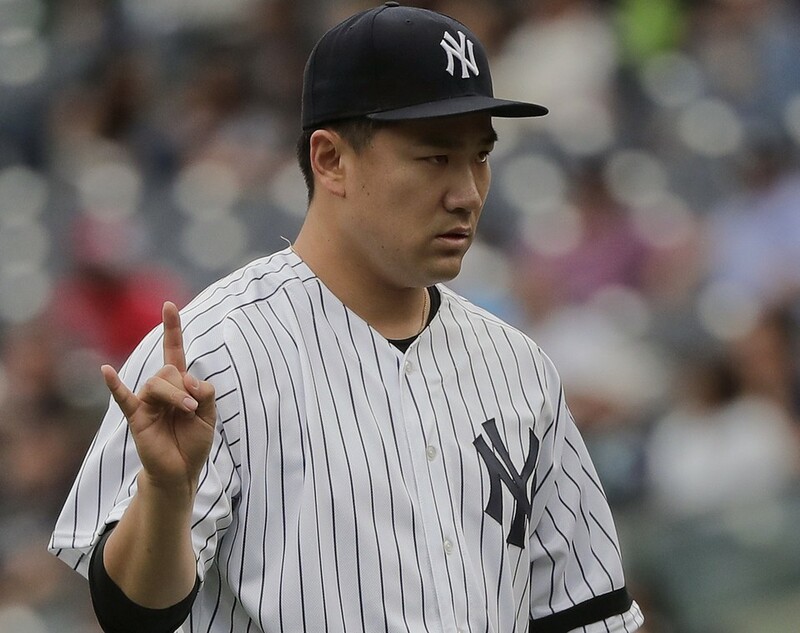 I ripped Masahiro Tanaka for his last start and he looked at me and said "F-U!" with his latest performance. I love it! Outside of Dellin Betances, I liked everything about this game as the Yankees took down the Jays for their 90th win of the season on Friday afternoon. While many people were speculating about whether this was Masahiro Tanaka's final regular season start wearing a Yankees uniform, Masa-hero came out strong. I always like to use the first inning as a barometer and Tanaka was firing on all cylinders, striking out the side on thirteen pitches. In the bottom of the first, Jacoby Ellsbury hit a one-out single through the hole to shallow left field off Blue Jays starter Joe Biagini. With Aaron Judge at the plate, Ellsbury stole second for his 22nd stolen base of the year. Judge ended up taking a walk anyway. Didi Gregorius was next and he singled to right on a looper that dropped in front of right fielder Michael Saunders to load the bases. Starlin Castro hit a soft grounder between third and the pitching mound, and Biagini had no play by the time he got to the ball. Ellsbury scored on the play. Greg Bird's sacrifice fly to deep center scored Judge. 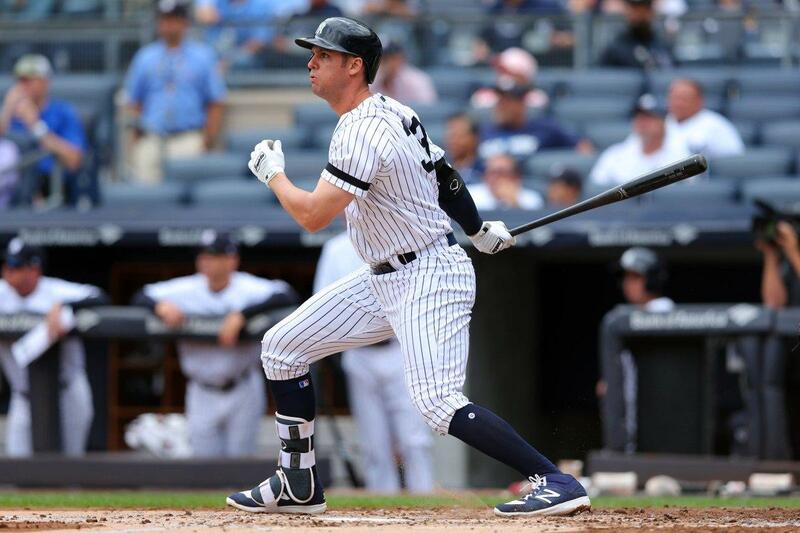 It was the seventh consecutive game with a RBI for Greg Bird who has gone from a season afterthought to one of its prime performers in a matter of just a few weeks since he returned from the disabled list. Chase Headley struck out to end the inning but the Yankees had a 2-0 lead. Tanaka held the Blue Jays hitless through two outs in the top of the 5th inning, when Ezequiel Carrera hit a grounder to second. Starlin Castro went hard after the ball, crashing his knee against the ground, but his throw was not in time to get Carrera at first. With Raffy Lopez batting, Carrera stole second. 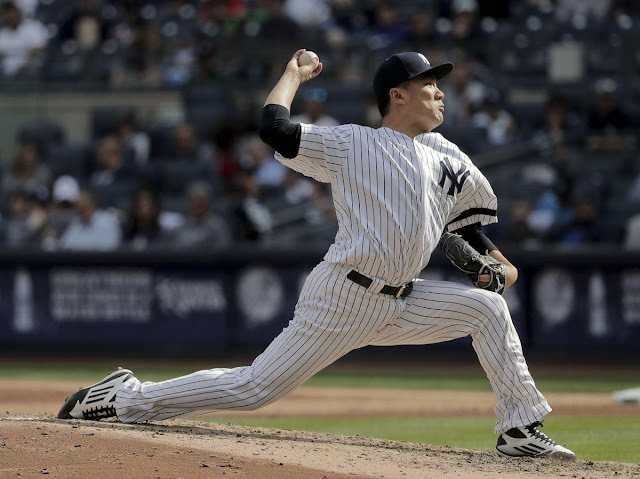 However, Tanaka got out of the inning when he turned to fire a perfect strike to Didi Gregorius at second to nail Carrera who was trying to dive back to the base. Austin Romine led off the bottom of the 5th with a single over the second baseman's head into right center. Romine was forced out at second when Aaron Hicks hit a grounder to second but Hicks was safe at first. With Jacoby Ellsbury at bat, Hicks stole second. Jacoby Ellsbury lined out to first for the second out. Aaron Judge followed with a single to left, scoring Hicks. Blue Jays catcher was up the line for the outfield throw so there was no play at the plate but they got Judge between first and second for the final out. Ryan Goins picked up the Blue Jays' second hit off Tanaka in the 6th, a single to center that dropped in front of Jacoby Ellsbury, but Tanaka was still mowing hitters down so Goins didn't go anywhere when Tanaka struck out the side again. Thirteen strikeouts through six innings for Tanaka. Incredible. Matt Dermody replaced Biagini in the bottom of the 6th inning. Didi Gregorius led off with a single to left. With Starlin Castro batting, Didi Gregorius stole second on what appeared to be third strike on Castro. However, Joe Girardi came out with the argument that it was a foul tip. The umps agreed with Girardi, and Didi returned to first base with Castro coming back to the plate. Two pitches later, the outcome was the same. Castro swung at the third strike but Didi successfully stole second. Next, Greg Bird (rapidly becoming one of the Yankees best post-trading deadline "acquisitions") drilled a line drive single off the wall in the right field corner to score Gregorius. Danny Barnes entered the game in relief of Dermody and induced Chase Headley to hit into an inning-ending double play, but no matter, the Yankees had increased their lead to 4-0. Tanaka allowed one more hit, a double down the line into the left field corner by Josh Donaldson in the top of the 7th, for a total of three. Donaldson got as far as third on a ground out, but Tanaka retired the next three batters in order including two by strikeout to end the inning and his time in the game. He finished with fifteen strikeouts to go with no hits, no runs, and no walks. It was simply an outstanding performance by Tanaka. If this was his final regular season start as a Yankee, thank you very much. It was a masterpiece to remember. David Robertson pitched the 8th inning. It started with the first walk by a Yankees pitcher in the game, but the runner was erased on a beautiful double play. Raffy Lopez hit a grounder to Greg Bird at first. Bird threw to Didi Gregorius for the force at second. Didi's throw back to first hooked out but Bird sprawled out on the ground for the catch with his right foot still on the bag. Excellent defensive play by Bird. D-Rob struck out Ryan Goins to end the inning. The 9th inning was not quite as much fun...at least not at the start. 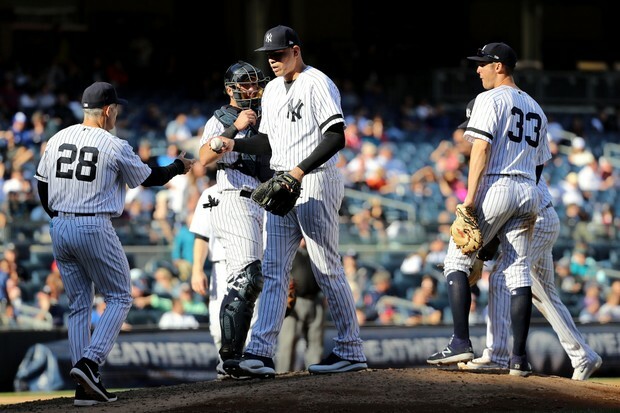 Dellin Betances came in with a chance to prove he has finally righted the ship. Richard Urena had other ideas and led off with a single to right, a one hop off the wall. With Teoscar Hernandez at the plate, a Betances pitch went off Austin Romine's glove for a passed ball on the catcher. Urena moved to second. Betances ended up walking Hernandez and all you could do was shake your head. End of Betances, who is running out of time to prove that he can be trusted with late inning relief again. I hate to say it, given my disdain for the man, but Dellin is proving Yankees president Randy Levine was right for his critical comments about Betances after the reliever's arbitration hearing in the off-season. Enter Aroldis Chapman. Man, oh, Man, I am so happy this guy is the Missile again. He struck out Josh Donaldson on three pitches for the first out. Jose Bautista hit a grounder to short and the Yankees were able to force Hernandez out at second but they couldn't turn the double play when the ball went over Greg Bird's head. The ball bounced back so Urena had to hold at third. With Rob Refsnyder batting, Bautista took second on defensive indifference. Chapman laid three 100+ mph fastballs across the plate for Refsnyder, with the last pitch hitting 102 mph. Three swings and misses by the former Yankee. 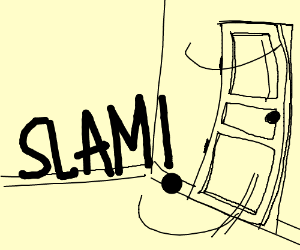 Game over. Yankees win! The Yankees (90-70) looked like a playoff team in this game. They picked up a game on the Boston Red Sox, who lost 3-2 to the Houston Astros at Fenway Park. The Yankees trail the Sox by two games with two to play. I don't expect the Yankees to catch the Red Sox but they've certainly made it interesting these final days of the season. Mike Axisa had a great tweet after the game about Tanaka pitching on seven days rest: "One day it will be acknowledged that Tanaka does not actually pitch better on extra rest. Today is not that day." The Yankees have announced a pitching change for today's game at 1:05 pm ET. CC Sabathia (13-5, 3.84 ERA) gets the start over Jaime Garcia since the Yankees are still in contention for the AL East title. Considering I am not a fan of Garcia, I like the move even if it doesn't yield the division title. Sabathia will be opposed by Toronto's Marcus Stroman (13-8, 3.06 ERA). A great long-time (soon to be ex?) Yankee versus a great potential future Yankee? Today, let's go with the past! 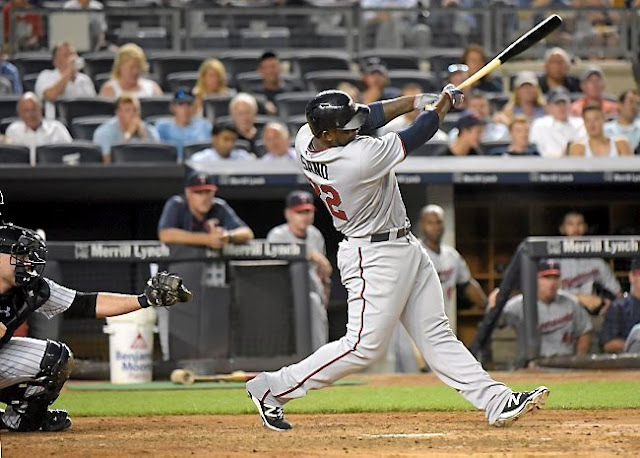 The Minnesota Twins have activated their best hitter, 3B Miguel Sano, off the disabled list. Sano was placed on the DL in August when he fouled a ball off his left shin. Sano will have the weekend to get ready for next Tuesday's Wild Card game. Tonight, I will be at Coors Field to watch Clayton Kershaw and the Los Angeles Dodgers take on the Colorado Rockies. It will be Kershaw's final appearance of the regular season as he tunes up for his NLDS Game 1 start next week. This will be the first time I get to see Cody Bellinger play in person. It should be a great game. As a former Los Angeles resident, I have so missed the ability to go to Dodger Stadium on a regular basis. Have a great Saturday! My only request for today is a Pinstriped victory! Let's get Greedy! Go Yankees!